Insights from the movie The Grey | In the Key of "H"
The Miami heat are on a 26 game winning streak. That’s somewhat impressive but lost in all the media hype is the fact that this Sunday marked the longest preaching streak of my young “career” at 4 weeks in a row. Now Lord willing this will pale in comparison when our new church plant gets going, but some people have begun to compare these two amazing streaks (at least one person has….). Yesterday I alluded to a movie where a band of Alaskan plane crash survivors are picked off one by one by a pack of wolves. 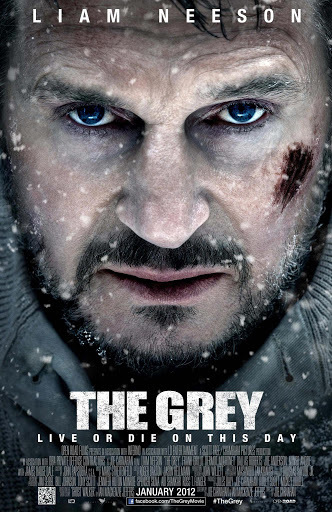 The movie is called The Grey. It is a quite disturbing film, but one also jam packed with deep existential questions and competing philosophies. One of the closing-though not final so this is not a spoiler alert-scenes depicts a hardened and formally agnostic Liam Neeson yelling at God, if He’s there, to do something, deliver him, and reveal Himself. He releases a number of expletives directed at God, not referring to Him as a father, but as Mother ________ (and we’re not talking about the mother hen gathering her chicks imagery-Matt 23:37) demanding that he prove Himself. The scene is moving. It really is. He has just uttered his first prayer in the movie crying out to Jesus to help him with a task and Jesus says, “no.” You want to hear an answer. At least I did. It seems, “Ok God, here’s your chance!” But there is no response from the heavens. Perhaps God doesn’t respond to expletives? After all, everyday there are crazy winged creatures flying around His throne declaring Him, “Holy, Holy, Holy” (Isaiah 6). Perhaps, but the answer is much more complex than that. And much more simple. Now I don’t know the director’s intent, but this non-reponse from God is actually quite biblically consistent. I don’t think this director leaves us with a movie devoid of God. There is much more than the plethora of “f-worded terms of endearment” behind God’s non-response. Here are a number of them. 1.) Jesus never responded to “prove yourself” demands. He didn’t do it with Satan. He didn’t do it with folks who demanded signs. That is just not how He rolls in the bible, so we should not think it should be any different in the real world, or in the cinema for that matter. 2.) Miracles in and of themselves, never, by necessity, lead or have led to a person believing in Jesus as Savior and Lord. Never. When Lazarus was raised from the dead, the Pharisees saw that miracle and wanted Jesus dead. Immediately. They wanted Lazarus dead too! But it is not just a Pharisaic response, but also a Gentile response. In Acts 14, Paul and Barnabas heal a crippled lad. The country folks don’t turn to immediate faith in Jesus, but consider Paul and Barnabas to be Hermes and Zeus respectively. They can barely stop the locals from offering sacrifices! Likewise, God speaking audibly or doing a crazy miracle today will not make anyone by necessity, become a Christian. Data has to be interpreted through the grid of a worldview. A “proof” of God’s existence doesn’t make someone repent, rest upon on Jesus’ finished work on the cross. Miracles were/are never sufficient in and of themselves to produce saving faith. 3.) God has already revealed himself in Creation and Conscience. According to the bible, the existence of this physical world tells some of the story. Psalm 19 reminds us that the heavens declare God’s glory and something about Him. Romans 1 reminds us that the existence of the invisible God can be discerned from the visible world. Ecclesiastes 3:11 explains that God has put the idea of “eternity” in the hearts of men. 4.) God has already revealed himself through the person of Jesus, who is the “image of the invisible God.” Now of course only one generation in a small part of the world actually laid eyes upon this Jesus. But those eyewitnesses of his resurrection didn’t just risk life and limb to spread this news, all of them lost life and limb with only one exception. Regardless if you believe Jesus is who he says He is, God’s answer to the demand he prove Himself will always be the same: I already have. Don’t miss it. So when you’re tempted to demand God prove Himself, and then base your faith upon whether He does or doesn’t prove Himself to you satisfactorily, remember He already has proved Himself in Jesus. This entry was tagged apologetics, movie reviews, nature, The Grey. Bookmark the permalink.